From the former U.S. Assistant Secretary of Education, "whistleblower extraordinaire" (The Wall Street Journal), one of the foremost authorities on education and the history of education in the United States, author of the best-selling The Death and Life of the Great American School System; The Language Police ("Impassioned.... Fiercely argued.... Every bit as alarming as it is illuminating"—The New York Times); and the now-classic Great School Wars: A History of the New York City Public Schools—an incisive, comprehensive look at today's American public schools that argues persuasively against those who claim our public school system is broken, beyond repair, and obsolete; an impassioned but reasoned call to stop the rising "privatization movement" draining students—and funding—from our public schools, a book that puts forth a detailed plan of what needs to happen to schools and with public policy to insure the survival of this American institution so basic to our democracy. In Reign of Error, Ravitch makes clear that, contrary to the statements being made about disastrous public school test scores and graduation rates, these figures are the highest they've ever been in history—and that dropout rates are at their lowest, this according to the National Assessment of Educational Progress, a no-stakes test for children of all races. 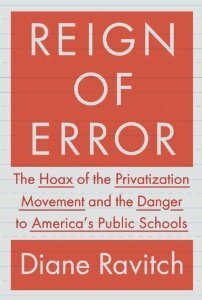 Ravitch puts forth a chapter-by-chapter breakdown of what can be done to preserve public school education, making clear what is right with our education system, how policy makers are failing to address the root causes of educational failure, and discussing in detail how to fix these problems.